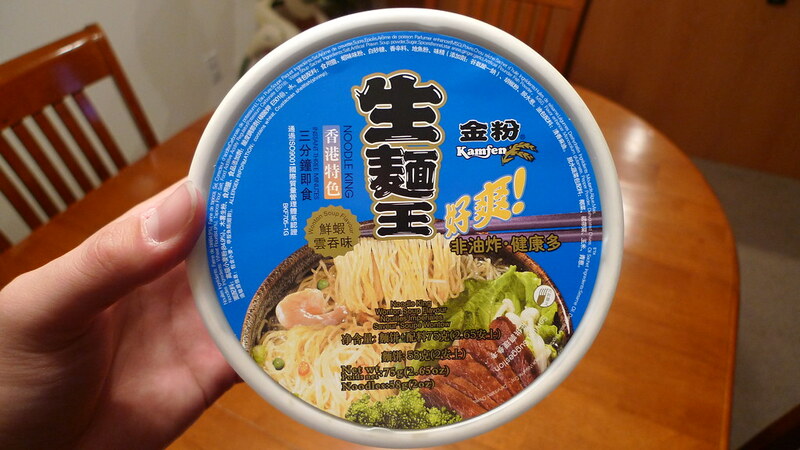 Kamfen Noodle King - Wonton Soup Flavor. 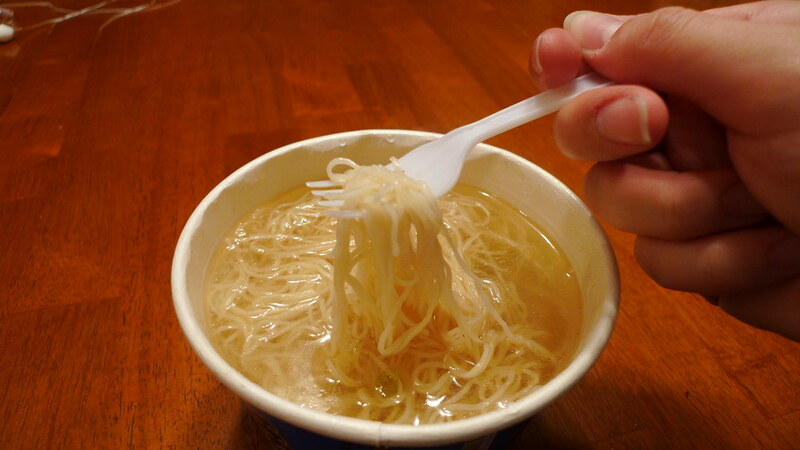 I love wonton soup; it's one of my favorite foods. 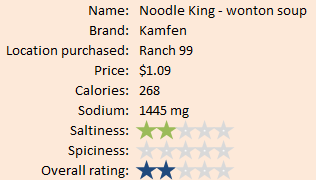 So, I was really excited to pick up Kamfen Noodle King wonton soup flavor. Is it any good? Click 'read more' to find out. 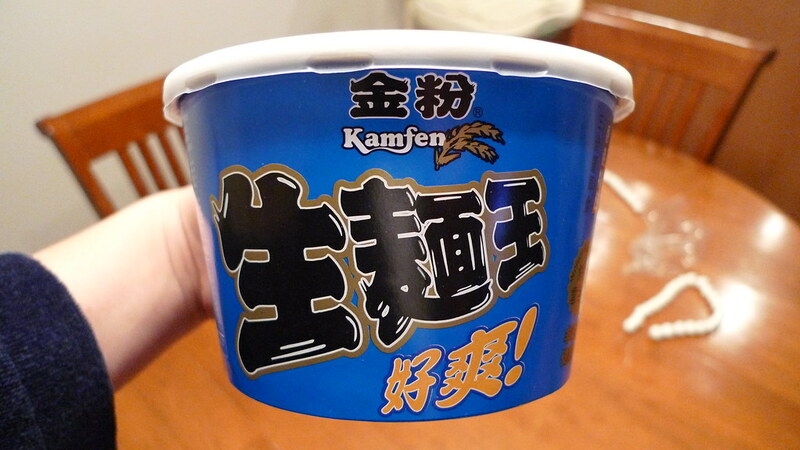 Kamfen's wonton flavored Noodle King comes in an attractive blue paper bowl. The picture makes it look like it might be wonton noodles, but they're not. I wasn't really expecting that since I've never really seen freeze dried wonton noodles before. Inside the bowl are a bunch of contents. 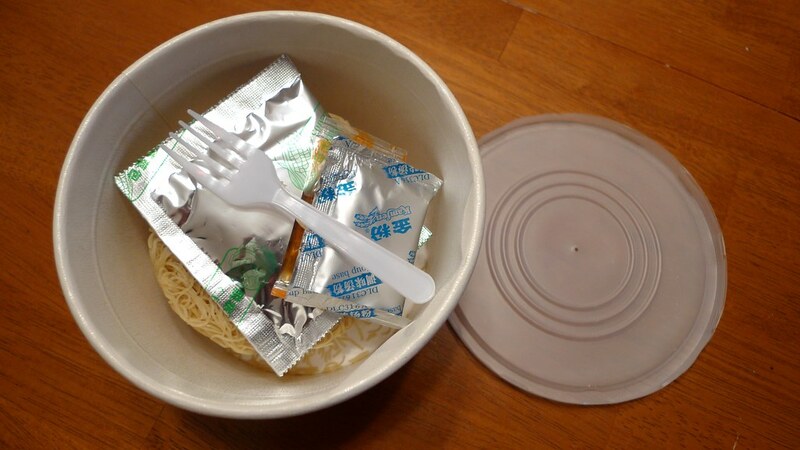 Kamfen supplies you with a small fork to eat with your noodles. 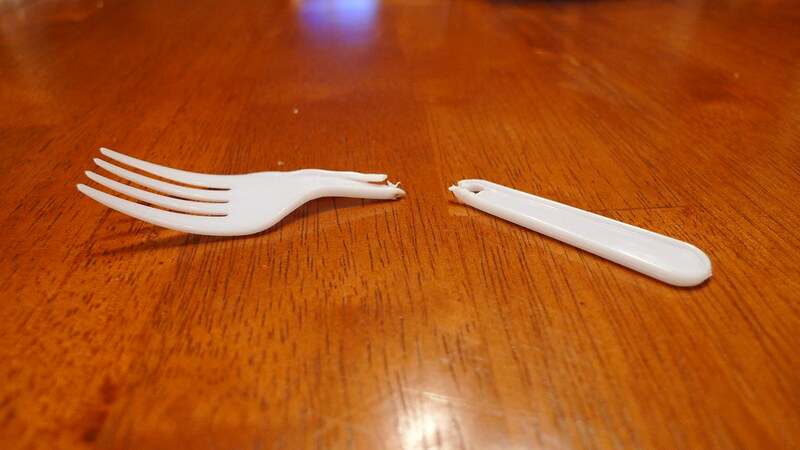 I wonder if they include the fork if you buy the product in China, where the product is made. Or, do they replace it with chopsticks there? 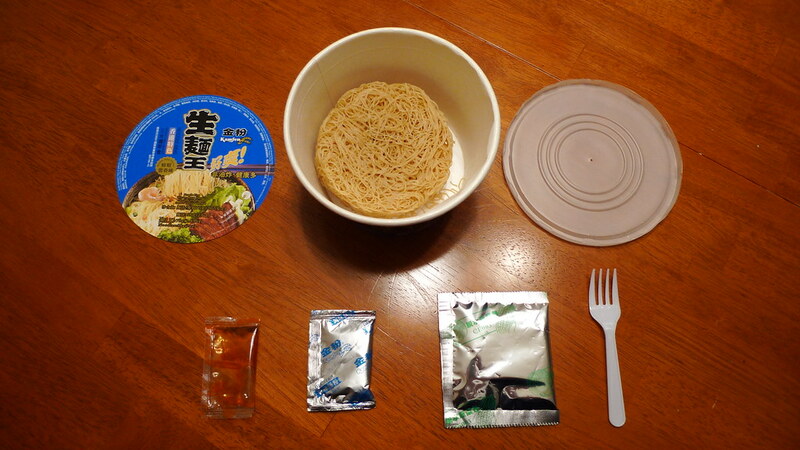 All of the contents of the Kamfen Noodle King bowl. Airlines might make you pay the carry-on fee if you take this on a plane. You get three packets that are the seasoning, the dried vegetables, and the oil. Alright... here we go. The seasoning... smells... AWFUL! It seriously smells like raw fish and fart. According to the ingredients, there's artificial prawn soup and flounder fish powders in it. Clearly the reason why my wife wanted to puke when I put the seasoning in the bowl. You're supposed to add all of the packets before adding the boiling water, so bringing in the sesame seen oil into the mix seemed to make it even worse. I can kind of see why wonton soup flavor would have shrimp in it. Some wontons are made with shrimp. But flounder!? Who is putting flounder meat in their wontons? The noodles in Kamfen's Noodle King. 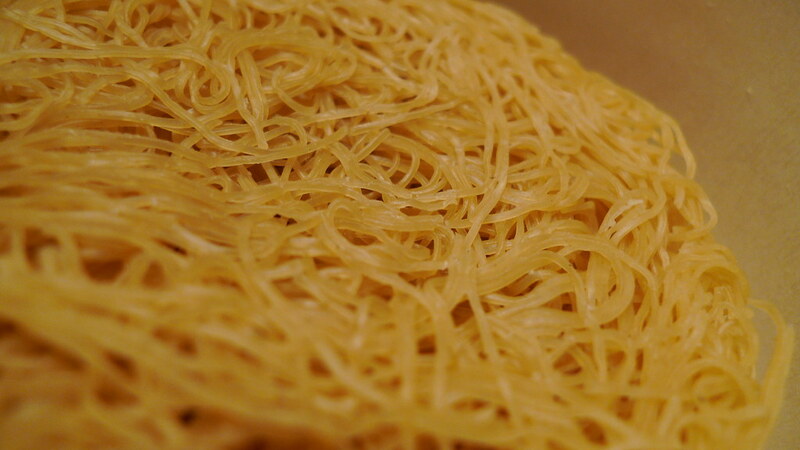 They look like rice noodles, but they're not. The smell aside, the soup actually tasted decent. Not too salty with some nice ginger and garlic spices. I could taste a little bit of the seafood taste, but it wasn't overwhelming. 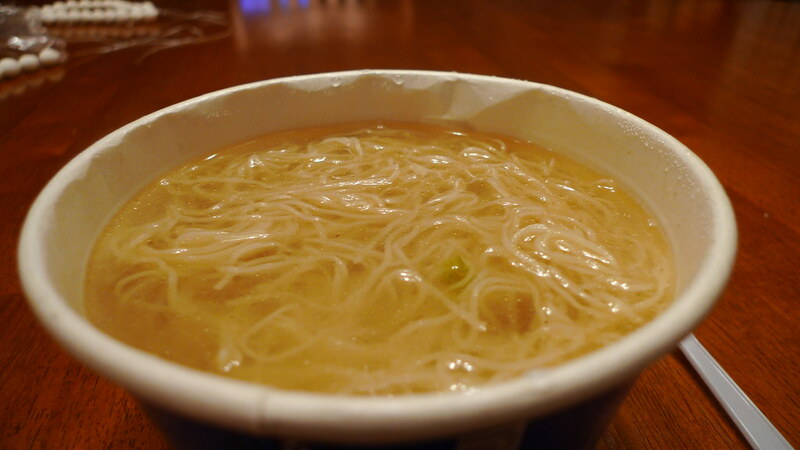 The noodles are very thin; almost like rice noodles. However, when you bite into them, they don't have that firm texture that rice noodles have. Noodle King's noodles have a higher wheat chew to it. Ah, much better. 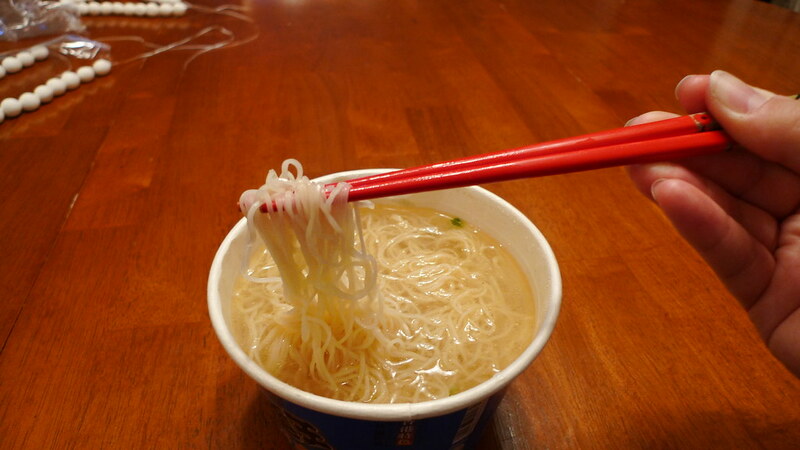 Using my chopsticks to eat King Noodle. Juliana did not get to try this because she was asleep at the time, but I think she would have eaten some. Overall, I can't say that I'd recommend this unless you don't mind stinking up your house. I especially would not recommend bringing it to work unless you work in a fish factory or fish market.